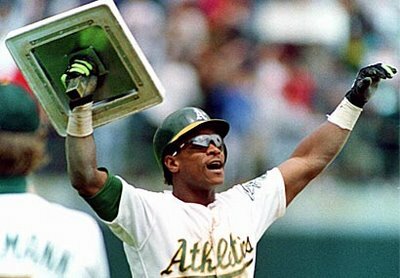 It was on this day in 1991 that Ricky Henderson stole the 939th base of his Major League career. That broke Lou Brock’s previous record of 938 stolen bases, giving Ricky the new MLB record. Henderson was the most prolific base stealer to ever play in the Majors, as he led the MLB in steals in 12 of the 25 seasons he played in the league. He also surpassed 100 steals in a season on three occasions (1980, 1982 and 1983). Henderson entered the 1991 season with 936 steals over the course of his first 12 years in the league, and his third steal of the season would give him the new record. He would finish the 1991 season with a league-high 58 steals, as he was invited to the final All-Star Game of his career. Henderson put together quite the prolific career, as he was named to 10 All-Star Games, won one AL MVP award and two World Series titles, and he holds the record for most steals in a career (1,406), most steals in a season (130), most runs scored in a career (2,295), and most games led off with a homer (81). Here is a look at Ricky Henderson’s speech after breaking Brock’s stolen base record.